One in five children live without electricity…. 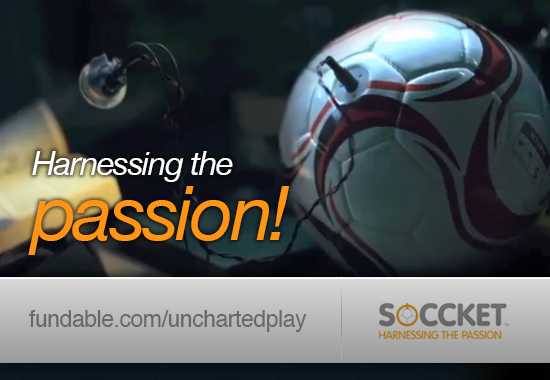 Uncharted Play created their flagship device, SOCCKET, to help change that. Kick a ball, create electricity. Simple, profound, and life changing. Within 30 days of launching, SOCCKET brought in $92,296 in pre-orders and has been dubbed as revolutionary by outlets like The New York Times, TechCrunch, and Fast Company. Hailed as brilliant by world leaders like Bill Clinton and Oprah, founder Jessica Matthews has turned her passion for helping others into a for-profit social business that creates life changing products. When describing founder Jessica Matthews at a Global Initiative for Innovation, former Clinton said “If There Ever Was an Innovator, She’s It”. The Uncharted Play team is finalizing prototypes for a portfolio of follow-on devices, combining play with cutting edge technology and making the world a better place. If you’re interested in being involved, receiving progress updates, or helping to spread the word, click here.